Apply Infadolan right after dermarolling and for some days after until the skin is healed. Apply just a little. If you are applying something else right after rolling, wait half an hour for it to absorb and then apply Infadolan. Do not wipe it off. Infadolan is especially intended for skin moisturizing and protection after rolling with long needles. So you should apply it after rolling with your 1.5 mm roller. Dermarolling / Microneedling / Re: Dermaroller + TCA 5 weeks apart? Yes, you can definitely apply 15% TCA in between dermarolling sessions. You can apply the A-Ret as soon as the skin is healed from the peeling. A-Ret is also a mild acid. It speeds up the turnover of the skin. You should follow our dermarolling instructions with regard to the Infadolan ointment. Infadolan is post-dermaneedling treatment, not pre-treatment. With regard to the Differin cream, follow their instructions but do not apply it to freshly dermaroller skin. These things are explained in our dermaneedling instructions already. If the acne has no whiteheads then you can certainly roll. Some people roll when they have mild actively infected acne, and they don't seem to suffer adverse effects either, but I'd still be cautious, esp. with longer needles. 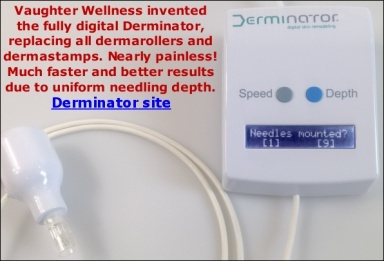 You are lucky because all your problems (scars and lip wrinkles) can be addressed by the same tool and that is a 1,5 mm dermastamp. Stamp the scars and immediately apply a 0.1 % Tretinoin cream (we sell it). There is currently no method that can completely remove a scar (unless the scar is very shallow). A deep scar can only be softened and make less visible. For the wrinkles around the lips, you may need a numbing cream (we also sell it). I can roll or stamp my whole face without a numbing cream, with the exception of the area around the lips. Are your scars on the inside of your forearms or on the top of your forearms or elsewhere? Are they raised or indented? What is their color? It is perfectly OK applying glycolic acid peel or anything else as soon as the skin is healed from needling, which takes normally just a few days. Post-needling hyperpigmentation may prevail for weeks in some cases but you can apply acid peels on post-needling hyperpigmentation. The full story behind the cause of stretch marks is not known yet. There seems to be a hormonal factor and a mechanical factor (stretched skin). Stretch marks will not fade by themselves with time. Stretch marks are very deep scars. If they are red, they will fade with time into white stretch marks but these white stretch marks will remain. If your stretch marks are white, they are likely much older than just a couple of months. I found another vendor - we've submitted an order - let's hope they'll respond.. Seriously, my recommendations are based on calculations based on a guideline of 200 pricks per cm2. You are free to deviate from that of course. We have contacted the French company that markets Aspivenin and they gave us wholesale prices, but the entire company seems to have vanished into thin air. They do not respond to emails anymore, they do not take their phone and when, after a lot of effort, we finally managed to get through to someone who knew them, we were promised they would get back to us the next day, which didn't happen. A similar story with another vendor of another suction cup product. These companies all seem to have gone out of business and the available products seem to be rest stock. If anyone can point me to a similar suction cup product such as Aspivenin, let me know. These products do not seem to be viable for their intended market (venom suction). When discussing how many times to roll, I use "rolling motions" on (currently) page 11 of our instructions, so in the context of how often to do a rolling movement over the skin, a "roll" is one hand movement. I replaced the word "roll" just now to make it more clear. Sorry for the very delayed answer. We were on holidays and I have been overloaded with questions recently. To be honest, I do not have any better advice for you than what you are already doing (a 0.5 mm dermaroller). If a whitening substance made it worse, it is not a good idea to advise you for example to apply it right after dermarolling for better penetration. You may have dermal melasma. You can search for melasma on this forum. Try the A-Ret cream but start using it in winter. A-Ret helps with hyperpigmentation but it also makes skin more sensitive to the sun. Sunshine would be beneficial to your white areas but it will likely worsen your dark areas so it doesn't seem to be an option. Have you noticed any change after rolling it with your 0.5 mm dermaroller?